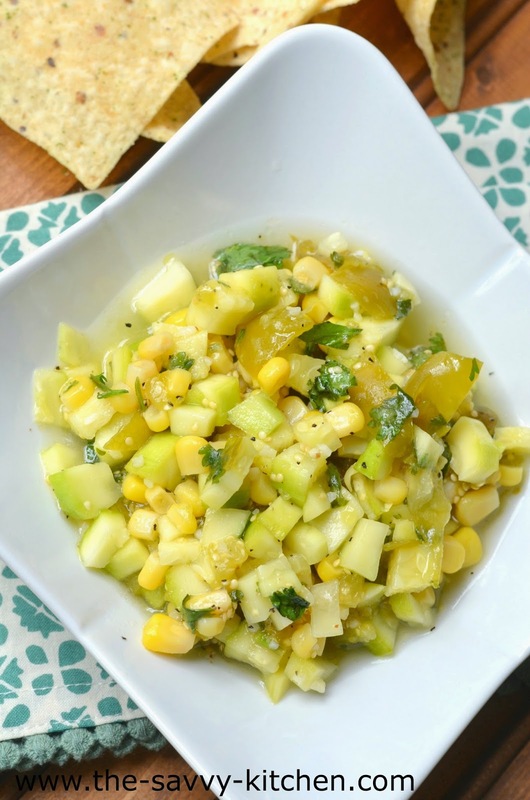 Tomatillo Salsa, which is also referred to as Salsa Verde, is a refreshing (and certainly summer-appropriate) appetizer. You can serve this salsa with chips, or it also makes a great topping for chicken and steak. 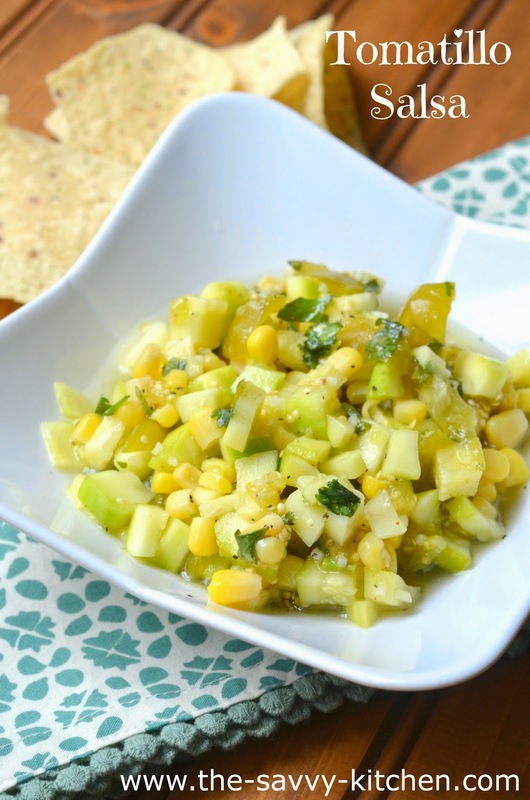 I tossed some cute green tomatillos with fresh lime juice, cilantro and garlic, then added chopped zucchini and corn for some additional crunch and texture. Enjoy! Using your hands, squeeze the juice and flesh from the tomatillos into a medium bowl. Chop up the skins, discarding any hard pieces, and add to the bowl. Add the zucchini, juice of 1 lime, cilantro, olive oil, corn, garlic and pepper. Mix well and refrigerate at least 30 minutes or until ready to use (can be made a day ahead of time). Nothing quite screams summer like fresh strawberries. Sure, you can usually find them year round. But in the summertime, they're perfectly juicy and sweet. Not like those off-season berries that are water-based. And packing them into a sweet treat makes them even more enjoyable! 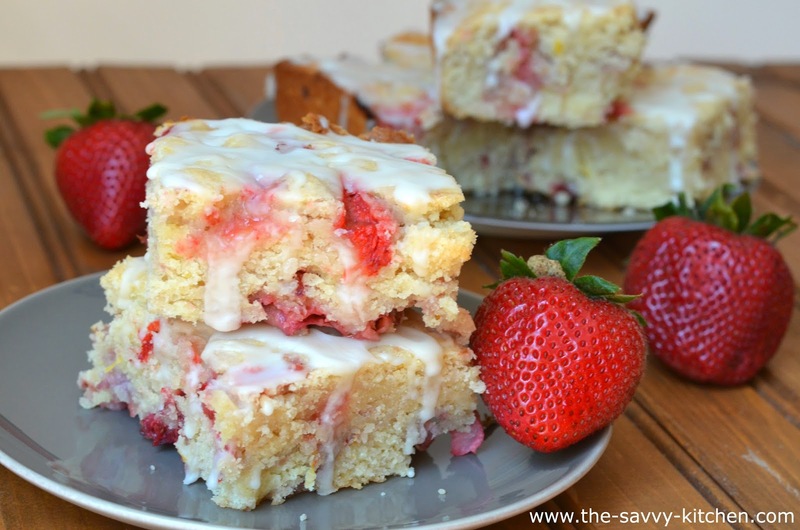 The combination of strawberries and lemon in these bars makes an amazingly refreshing and light summer treat. 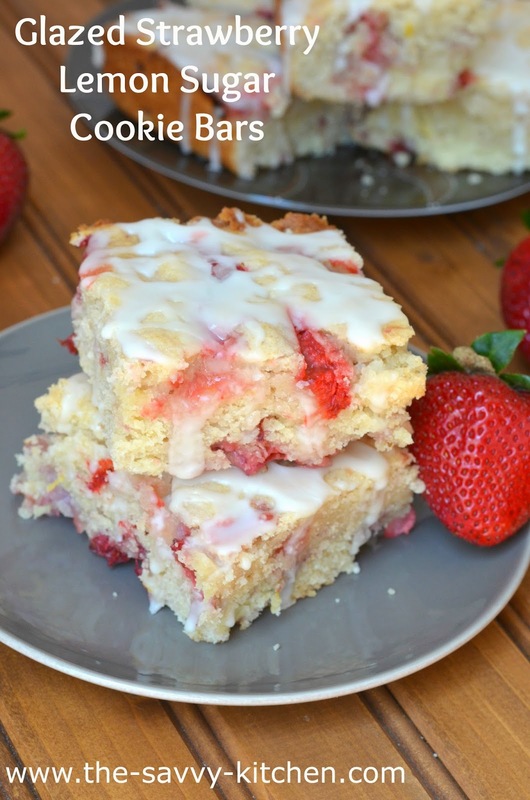 The base of the bar is a sugar cookie, so it has a texture that just melts in your mouth. Then it's topped with a basic powdered sugar glaze that adds a special touch of extra sweetness. Enjoy! Preheat oven to 350 degrees F. Spray an 8x8" pan with cooking spray and set aside. For the bars: In a large bowl sift together flour, baking powder and salt. In the bowl of your electric mixer cream sugar and butter together. Mix in egg, lemon juice, zest and vanilla. 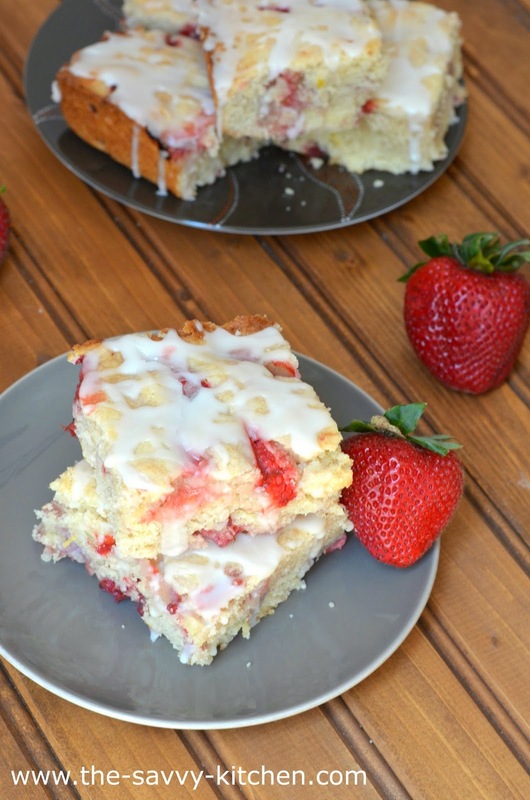 Blot the diced strawberries with a paper towel to remove any excess moisture. Fold in diced strawberries by hand. Press dough into the bottom of the prepared pan. Bake for about 35-45 minutes or until a toothpick is inserted and comes out clean. For the Glaze: Whisk together powdered sugar and water, or enough water to get to your desired consistency. Pour over cut and cooled bars. I'm very aware that a lot of people are adverse to Brussels sprouts. And you know how to get over that adversity? Cheese. Lots and lots of cheese. 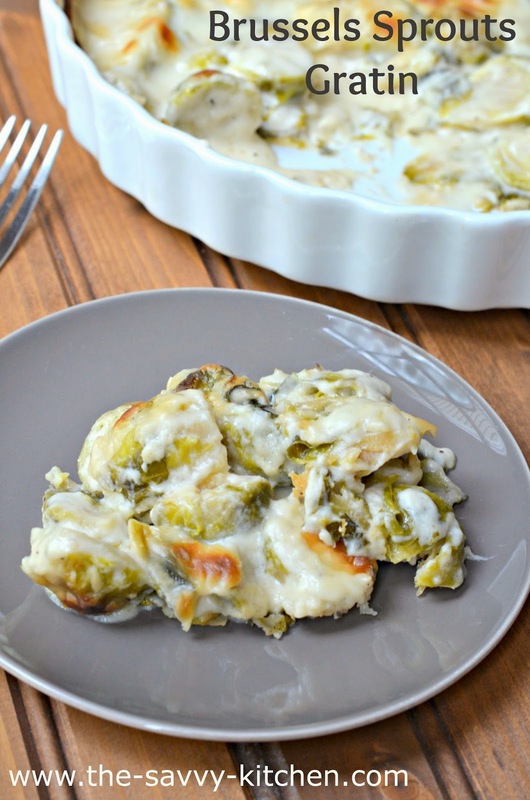 For this recipe, you make a basic cheese sauce, douse the Brussels sprouts in it, then bake it to crispy perfection. The sauce is creamy and masks some of the Brussels sprouts flavor (just in case you're not into it). 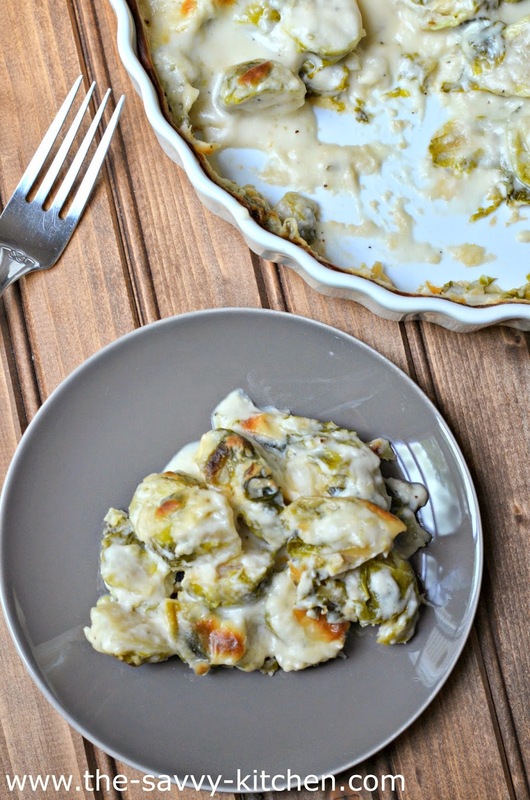 The two together are a winning combination for both Brussels sprouts lovers and non-lovers. Enjoy! Clean, trim stems of Brussels sprouts. Cut in half and keep all of loose leaves. Fill medium stock pot half way with water, bring to boil. Add Brussels sprouts , stirring in hot water and blanch quickly for about 2 minutes or until they turn bright green. Immediate drain and set aside. In large pan melt butter. Add flour and quickly stir with whisk to combine and remove clumps. Turn off heat. Add milk, salt, cheese, mayo and black pepper. Stir until cheese is melted. Add Brussels sprouts and combine with cheese mixture. Pour into baking dish and bake for about 30-45 minutes or until Brussels sprouts are tender. So Bradley hated chicken. I can't really blame him since the texture of pureed chicken breasts sort of resembles chalk. Sounds good, huh? We even mixed it with some pureed butternut squash to try to mask the flavor/texture, but he's one smart cookie and wasn't having it. At least we know he's not allergic and hopefully he'll enjoy it down the road when we prepare it a different way! Note: The same method can be used for both chicken and turkey. Bring a pot of water to a boil. Cut each chicken or turkey breast in half. Add to the boiling water and cook for 20 minutes, or until cooked all the way through. Drain the chicken or turkey and allow to cool slightly. Cut into small chunks. Add to a food processor and grind until it becomes somewhat powdery. Add water, a little at a time, until it reaches your desired consistency. 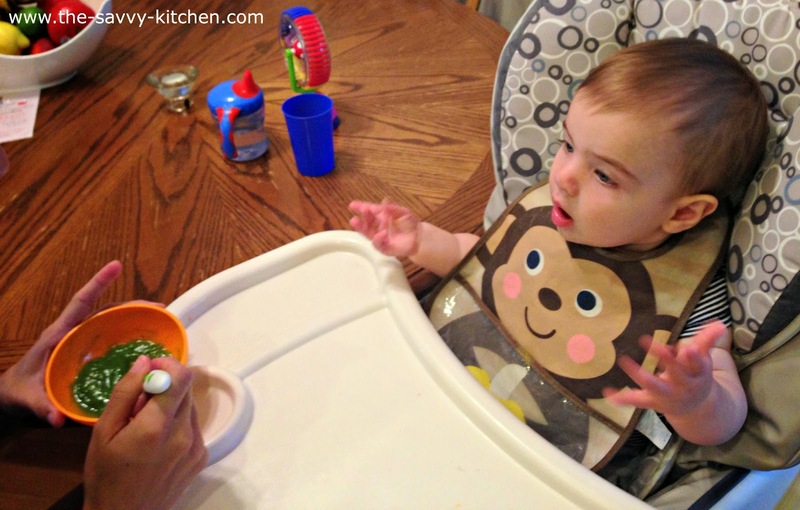 Allow to cool then serve to your baby with a spoon. I recommend adding a vegetable or fruit puree to the chicken or turkey, since it tastes somewhat chalky plain. If saving for a later date, pour it into storage cups to freeze or refrigerate. You can refrigerate up to 3 days or freeze for 30 days. Make sure you label your poultry! Once you are ready to serve, heat the refrigerated or frozen poultry up in the microwave and allow to cool to just warmer than room temperature. Add breast milk or formula to thin it out, if desired. I've played around with this recipe quite a bit, and I finally found a combination that both Chris and I love. 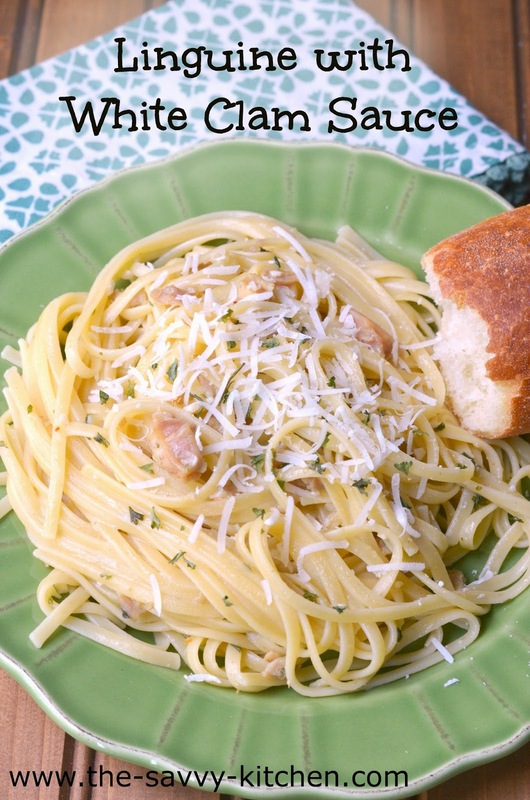 The key is lots and lots of garlic, big chunks of clams and their juices, using a crisp, dry white wine and topping it off with a dollop of butter to add extra creaminess. The flavors are simple, but each ingredient has a strong flavor that compliments all the rest. I serve this with a sprinkle of fresh Parmesan cheese and some crusty bread. Enjoy! Bring a large pot of water to a boil over medium heat. Drop the linguine into the boiling water and cook until the pasta is al dente. Meanwhile, coat a large saute pan with the olive oil and add the garlic and red pepper flakes. Bring the pan to a medium heat and cook until the garlic just begins to brown. Put the clams and their juices in the pan. Add the wine and parsley. Cover the pan and bring it to a boil over medium heat and cook about 5 minutes. Remove lid. Add the butter and bring the liquid to a boil. Toss in the cooked pasta. Cook the pasta and sauce together for an additional 2-3 minutes. Chris loves playing bartender and I'm glad he does...because he's good at it. He makes my all-time favorite Bacon Bloody Mary, and is also the creator of this amazing White Riesling Sangria. His most recent concoction? A cucumber mojito. I'll admit I was a little hesitant when I first tasted it. I think I'm used to having overly sweet cocktails, and this is anything but that. But after a second sip, I was in love. It's crisp, refreshing and light. A perfect cocktail for a hot summer evening. Enjoy! Start by making the simple syrup. In a small saucepan, combine the water and sugar. Stir over medium heat until sugar is dissolved. Remove from heat and allow to cool to room temperature. 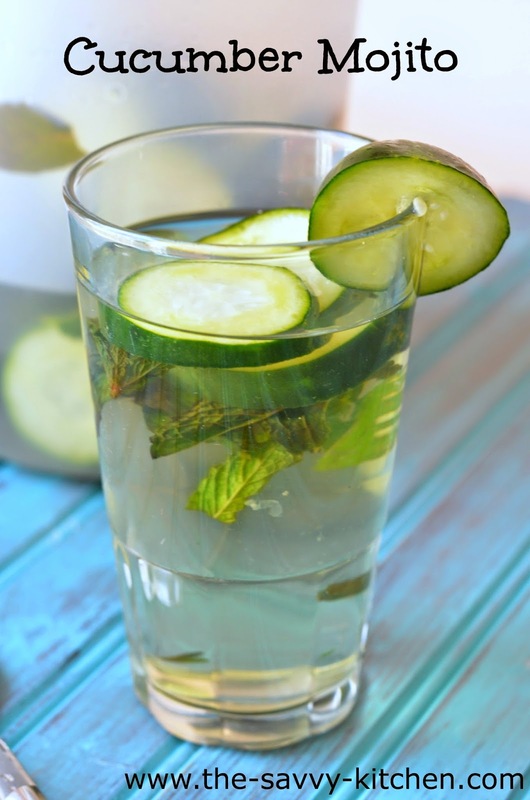 In a large pitcher, combine cooled simple syrup, rum, cucumbers and mint. Allow to chill for at least 2 hours or overnight. When serving, pour into glasses and top with a splash of club soda. If I had to pick one type of cuisine that I favored, I would be in deep, deep trouble. I obviously love Italian, but it has to be really good Italian. I also love Chinese, Japanese and Greek. I recently discovered some Thai food that I love, too, so that would also be up there. But Mexican definitely has to be on the very top of my list. 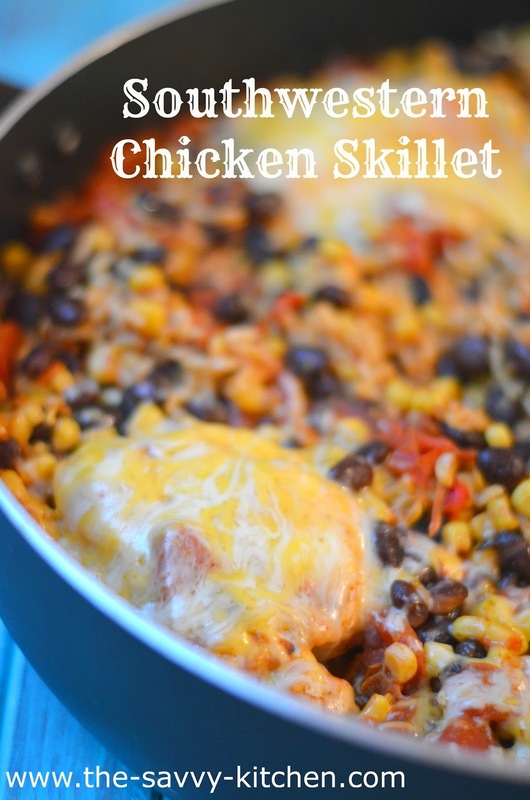 I love rice, beans, corn and traditional Mexican flavors, such as chili powder, cumin and paprika. This dish contains all of them, so I obviously loved it. Plus I topped it off with cheese. You're welcome. Heat oil in a large skillet over medium-high heat. Add chicken breasts and cook for 5 minutes per side, or until golden brown. 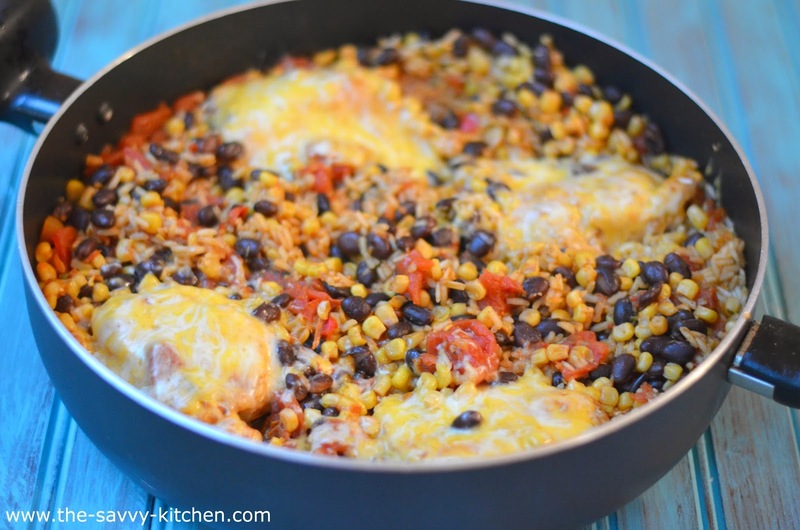 Add tomatoes, taco seasoning, water, rice, beans and corn to the skillet. Stir to combine. Cover and lower heat. Cook for 20 minutes or until rice is tender and chicken is cooked through. Sprinkle the chicken pieces with cheese and cover for an additional minute, or until cheese is melted. There's something about the combination of seafood and cheese that just weirds people out. I'm not sure why. I feel like cheese makes everything better, so I imagine it only makes seafood better too. No? When I told Chris I made this for dinner, he quickly told me he was in the mood for Chik-fil-A. I got the hint. So I covered it and put in in the fridge. The following day he came home for lunch and--SURPRISE--I baked up this casserole for us to eat. He was still weirded out, but gave it a shot. I think we were both surprised at how good it was. 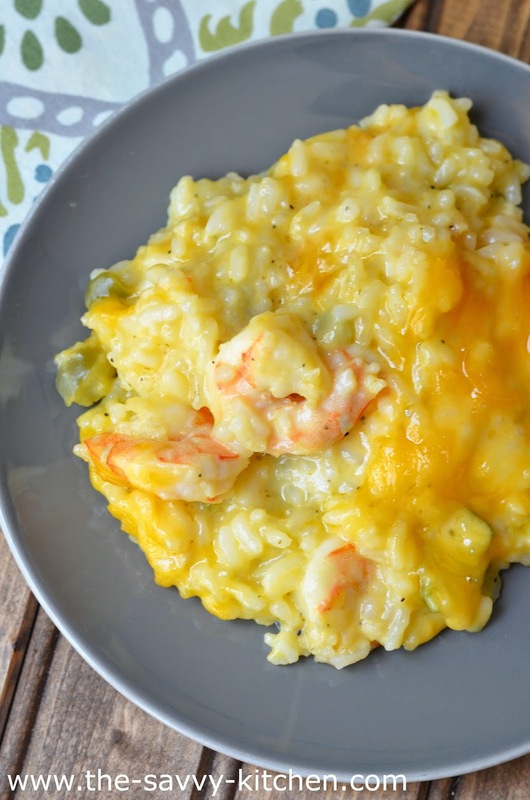 The cheese just makes the rice creamy and rich. There is a ton of added flavor from the onions, peppers and cream of chicken soup. The shrimp simply add some texture and some protein. Make sure you try the mixture before baking it. I had to add a fair amount of salt to get the flavors to where I wanted them to be, but it just made the dish much more flavorful. 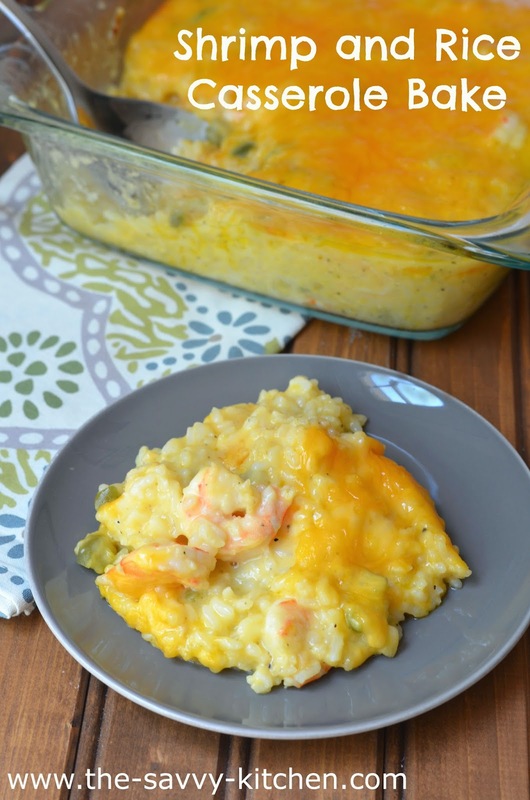 This is a yummy and comforting dish that the whole household will like. Enjoy! Cook the rice according to package directions. Turn off burner and set aside. Bring 2 cups water and 1/2 tbsp. salt to a boil in a medium saucepan and cook the shrimp for 1 minute. Drain immediately and set aside. Heat the butter in saucepan and saute the pepper and onion until soft and liquid is absorbed, about 5 minutes. 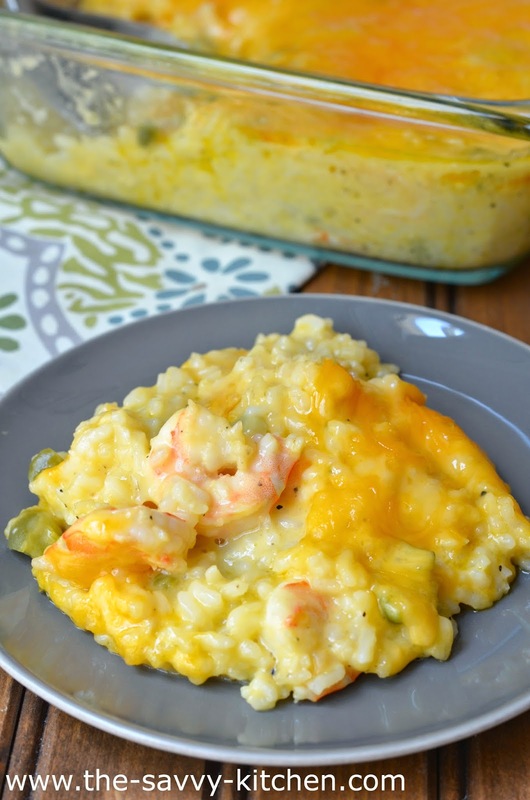 In a large bowl, combine the rice, soup, 1 1/2 cups of cheese, shrimp and vegetables. Add salt and pepper, to taste. Mix well. Spray a 9-inch square glass casserole dish with vegetable spray. Place the mixture in the pan and top with remaining 1/2 cup cheese. Bake for 30 minutes, until bubbly. 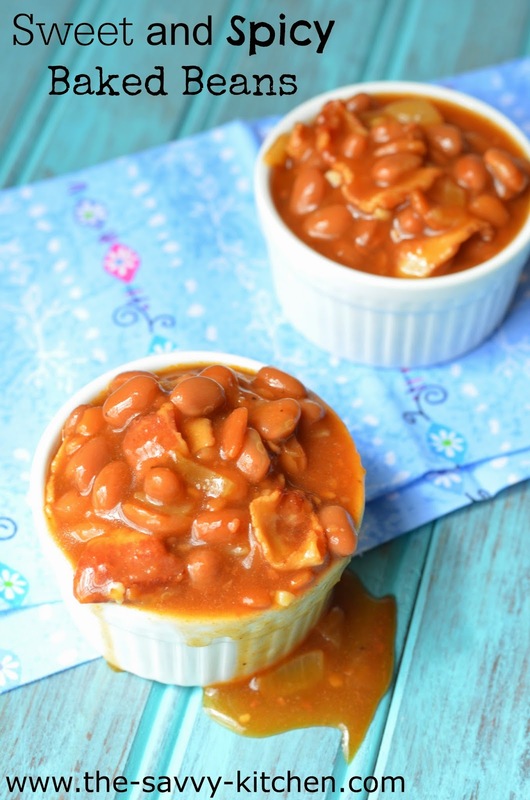 If you're looking for a unique and absolutely delicious baked beans recipe, I will recommend trying this Hawaiian Baked Beans recipe every single time. 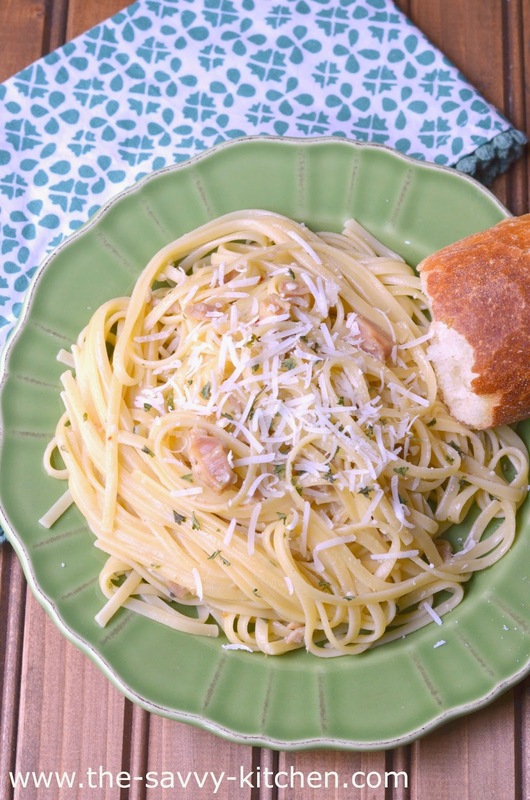 It's a family favorite and my mom makes it with almost every meal. That's how much we like it. 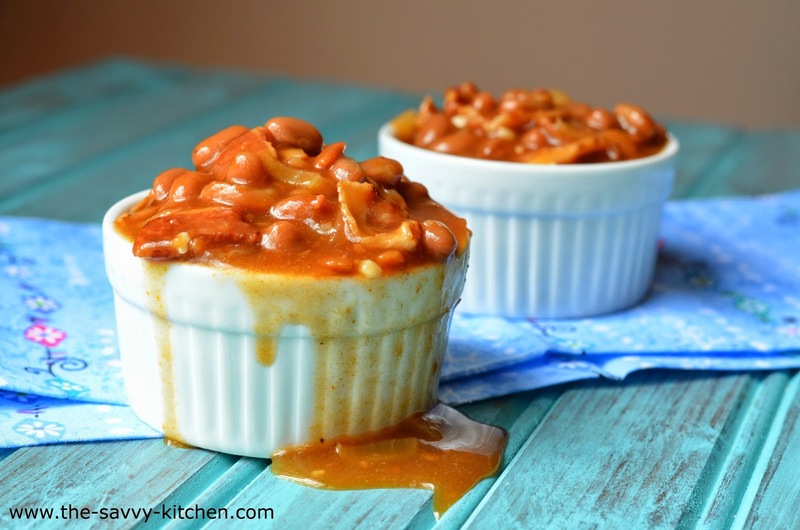 But if you want a twist on a classic recipe that doesn't use any surprise ingredients, this Sweet and Spicy Baked Beans recipe will be right up your alley. 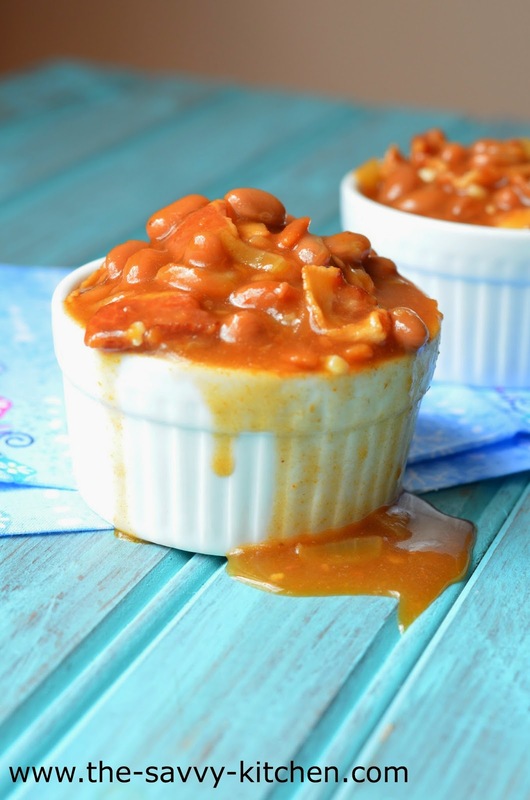 Standard cans of regular ol' pork and beans are the base of the dish, and then the flavor is amped up using a few common ingredients. And bacon. Of course there's bacon. 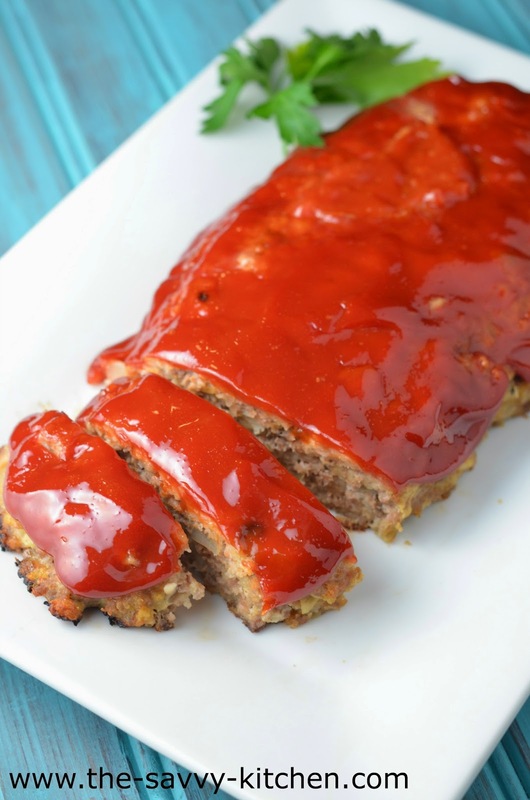 The sauce is sweetened up with brown sugar, and then gets a little spice from the barbecue sauce, Worcestershire sauce and dry mustard. And did I mention bacon? Enjoy! In a medium skillet, cook bacon until crispy. Remove from pan with a slotted spoon and allow to drain on a paper towel-lined plate. Meanwhile, remove all but 2 tsp. bacon grease from the pan. Turn the heat to medium. Add the onion and garlic and cool until onion is translucent, about 4-5 minutes. In a 8x8" glass dish (or a small casserole dish), mix the bacon, onion mixture and the remaining ingredients. Cook for about 30 minutes or until heated through. I usually peel vegetables and fruits before cooking and pureeing them for Bradley, but the skin of zucchini is so thin and soft so I decided to leave it on this time. Plus it contains a lot of nutrients, and I want Bradley to get all that he can! If you do decide to leave the skin on, I recommend buying organic products and scrubbing them really well before cooking. 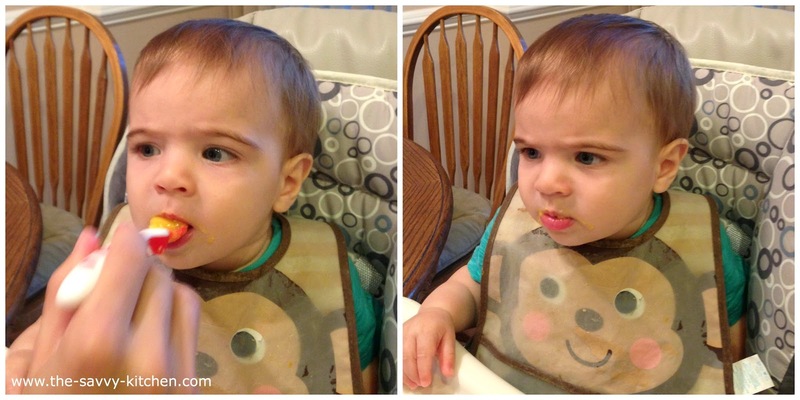 Bradley was a big fan of zucchini, just like every other food he has tried so far (except carrots). Just look at his arms going in anticipation of his next bite! Clean the zucchini well using cold water. Remove the ends and cut into chunks. Rinse under cold water again. Note: I kept on the skin since it contains a lot of nutrients. It is also thinner, so it purees easily. I also left the seeds in since they become tender while cooking and puree easily. 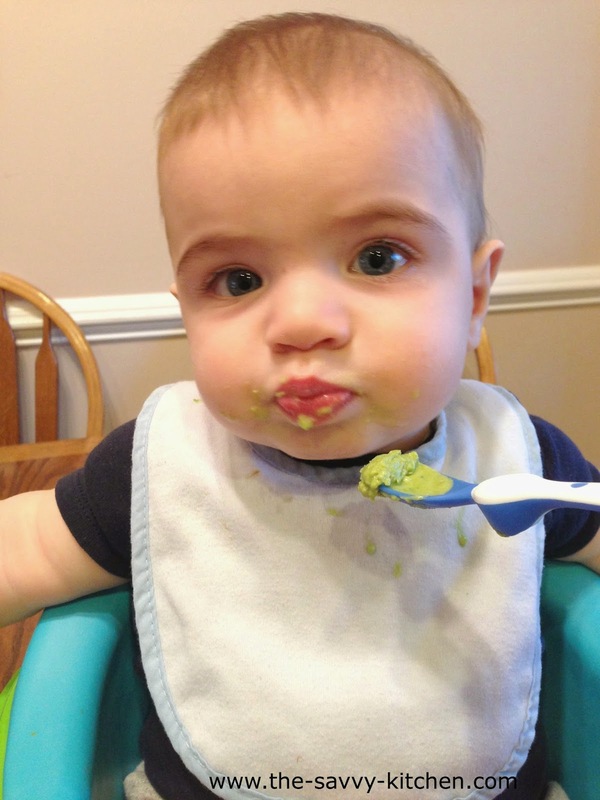 If you are worried about the texture for your baby, peel and seed the zucchini prior to cutting it up. Heat a large pot of water to boiling. Add the zucchini to the water and cook for 8-10 minutes, or until tender. Drain zucchini and add to a food processor. The zucchini retains a lot of water, so I did not find it necessary to add any to the puree. If you want a thinner consistency, feel free to add purified water to thin it out. 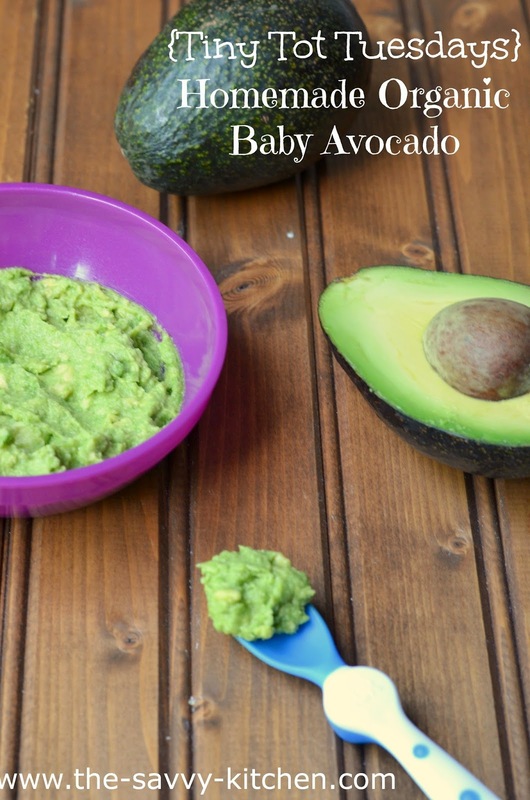 Allow to cool then serve to your baby with a spoon. 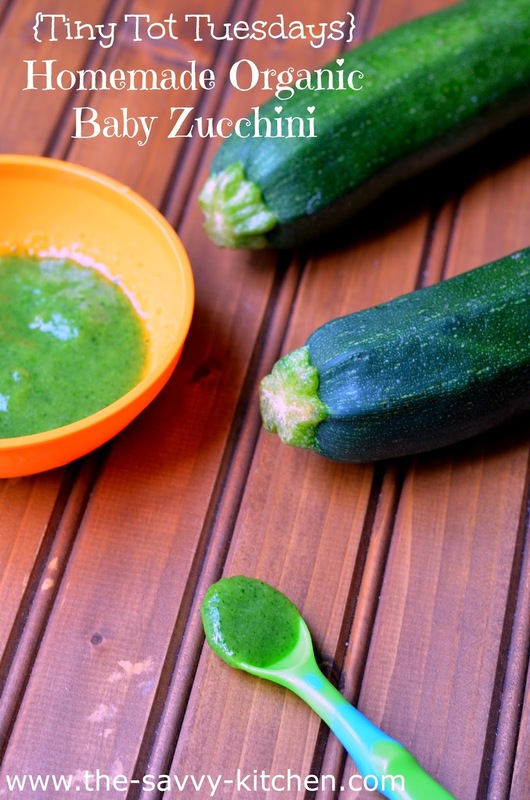 You can also add some breast milk or formula to the pureed zucchini to thin it out and add a flavor they already know and enjoy. If saving for a later date, pour it into storage cups to freeze or refrigerate. You can refrigerate up to 3 days or freeze for 30 days. Make sure you label your zucchini! 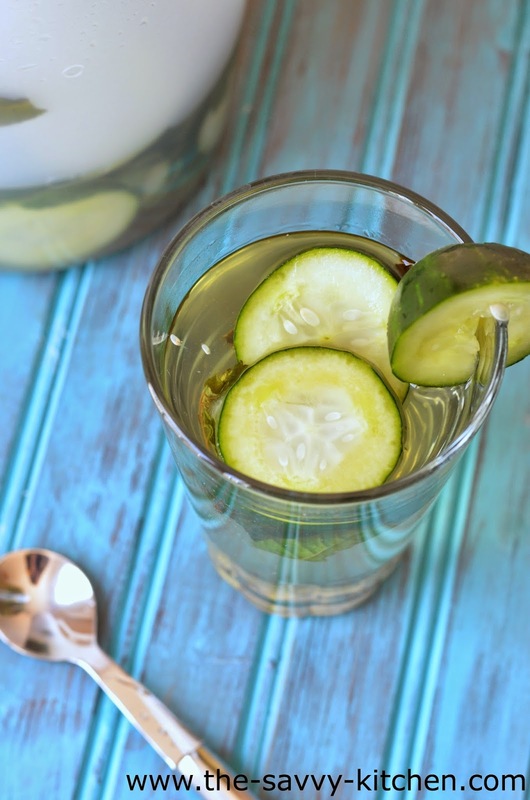 Once you are ready to serve, heat the refrigerated or frozen zucchini up in the microwave and allow to cool to just warmer than room temperature. 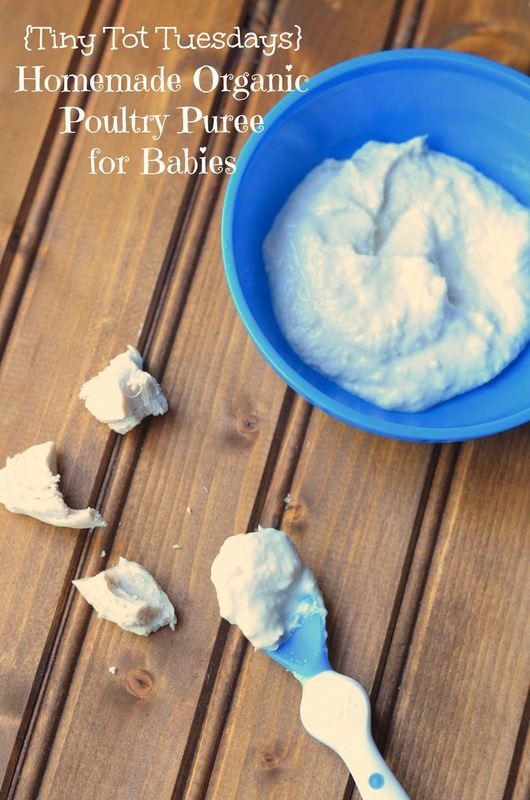 Add breast milk or formula to thin it out, if desired. 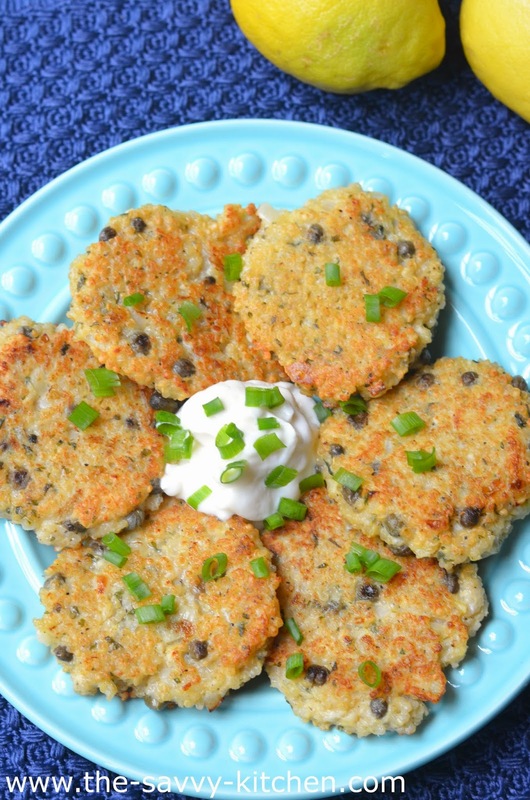 Here is an extremely quick and easy side dish that is bursting with flavor. 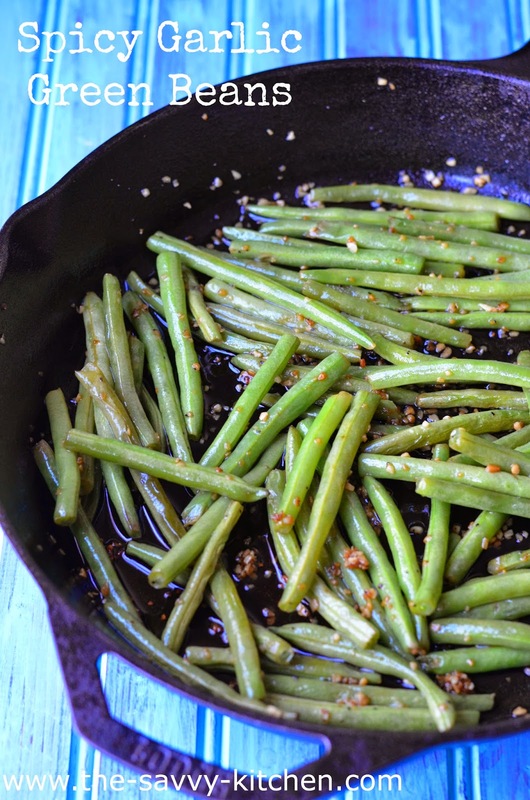 Fresh green beans are quickly blanched, and then pan-fried in garlic, butter, and red pepper flakes for some kick. The green beans maintain some of their crunch and therefore keep most of their nutrients. 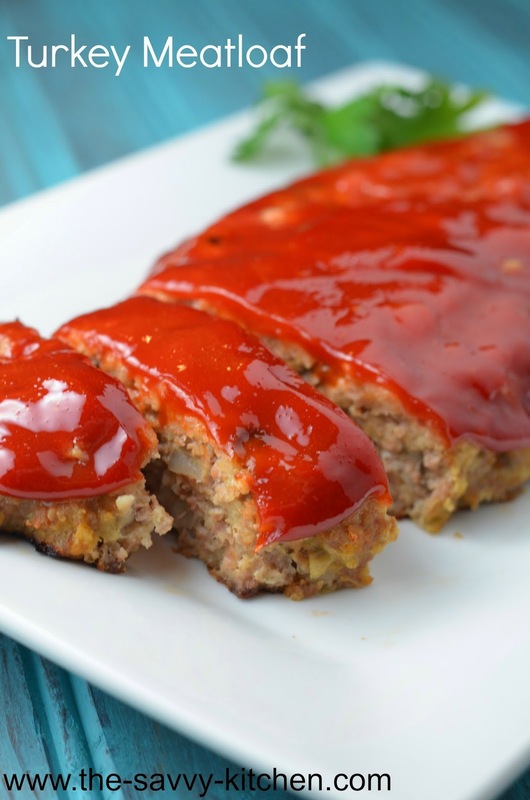 This could be on your table in under 15 minutes. Enjoy! Bring a large pot of water to a boil. Add green beans and simmer until green beans begin to soften, about five minutes. Drain green beans. In a large skillet, add butter. Once melted, add garlic and cool for 1 minute or until light brown. Add green beans, red pepper flakes, salt and pepper. 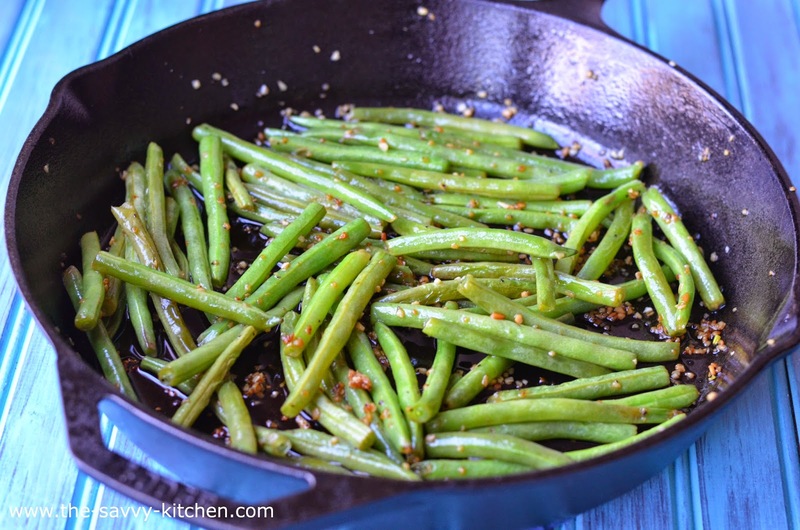 Cook for an additional 5 minutes or until green beans are tender. I absolutely love any and every type of stuffed mushroom. My mom makes absolutely incredible ones that are stuffed with a simple breadcrumb mixture. 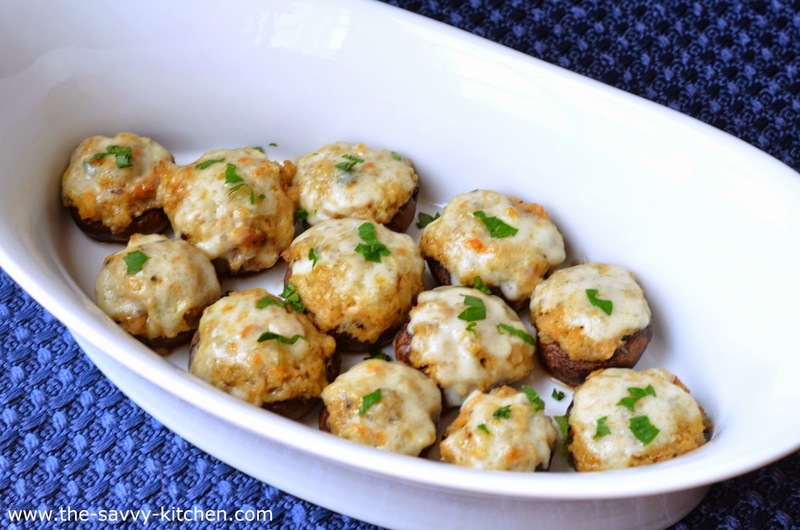 I also swoon over these French Onion Soup Stuffed Mushrooms that I made a while back. 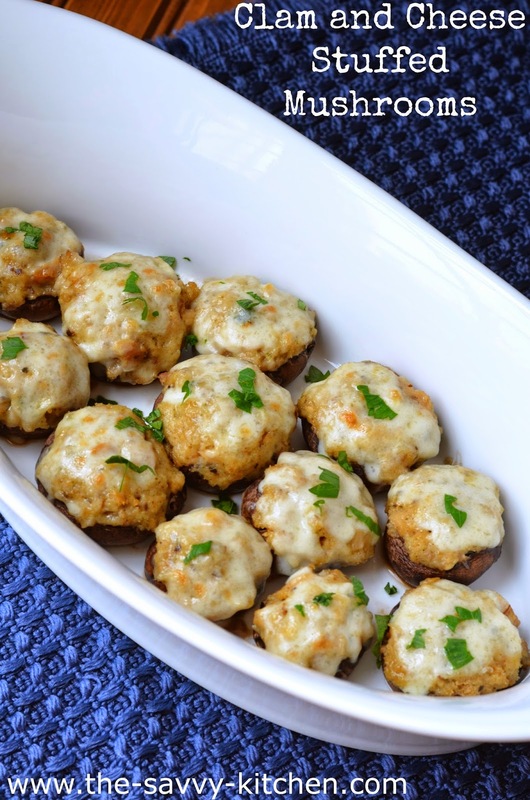 And these Clam and Cheese Stuffed Mushrooms? Just add them to the list. These mushrooms are cheesy and gooey and delicious. I love the addition of minced clams. 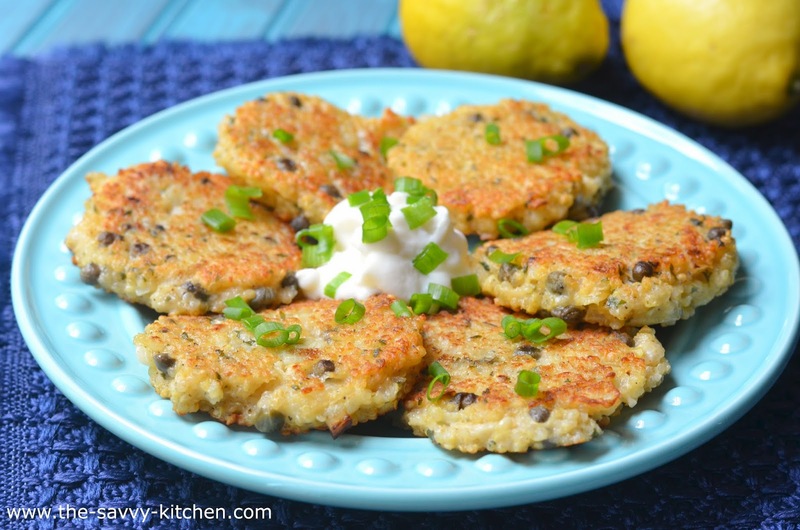 They add a different texture to the mushrooms and a slight seafood flavor. 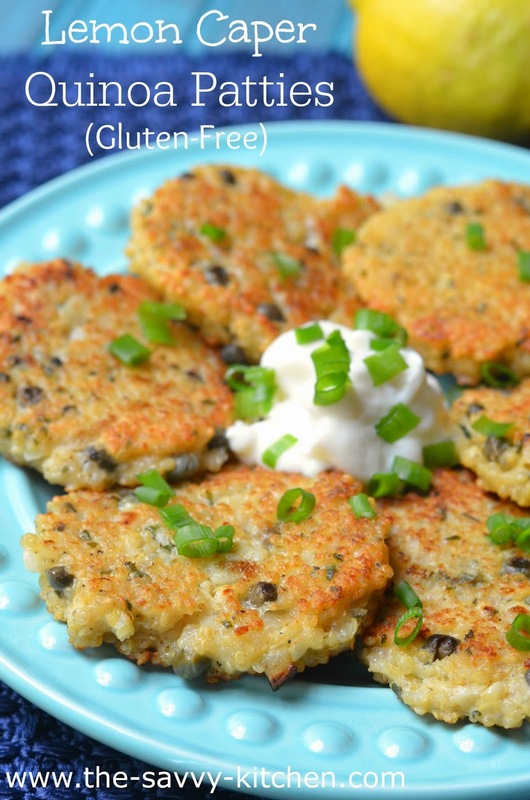 They would be perfect for an appetizer or as a side dish. Enjoy! Gently wash mushrooms using a damp paper towel and remove stems; pat dry. In a mixing bowl, place clams, onions, minced garlic, garlic powder, salt, 1 tbsp. melted butter and oregano. Mix thoroughly. Add Italian bread crumbs, egg, and reserved clam juice and blend. Stir Parmesan cheese and 2 tbsp. Mozzarella cheese in clam stuffing and mix well. Place clam mixture inside mushroom cavity and slightly mound clam mixture. You should be able to stuff between 8 and 12 mushrooms depending on the size of mushrooms. Place mushrooms in lightly oiled baking dish. Pour 1/4 cup melted butter over mushrooms. Cover and bake for about 35-40 minutes. 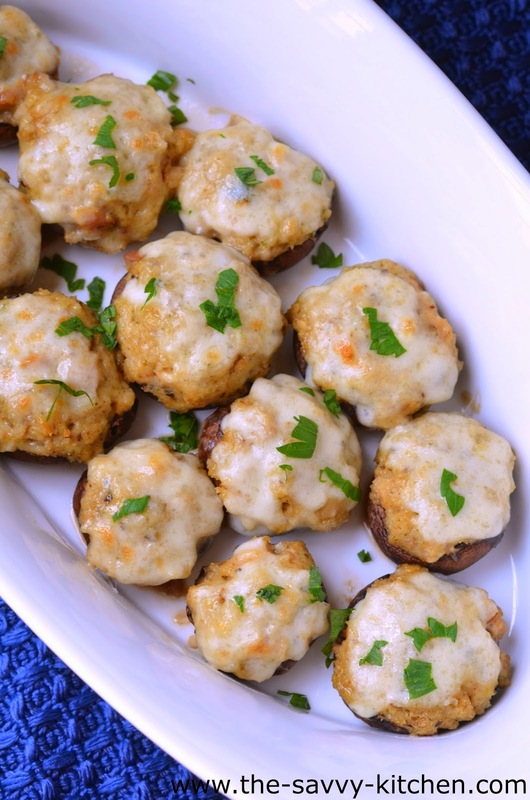 Remove cover, sprinkle 1/4 cup freshly grated mozzarella cheese on top of the mushrooms and pop them back in the oven just until the cheese melts slightly. Garnish with freshly diced parsley. 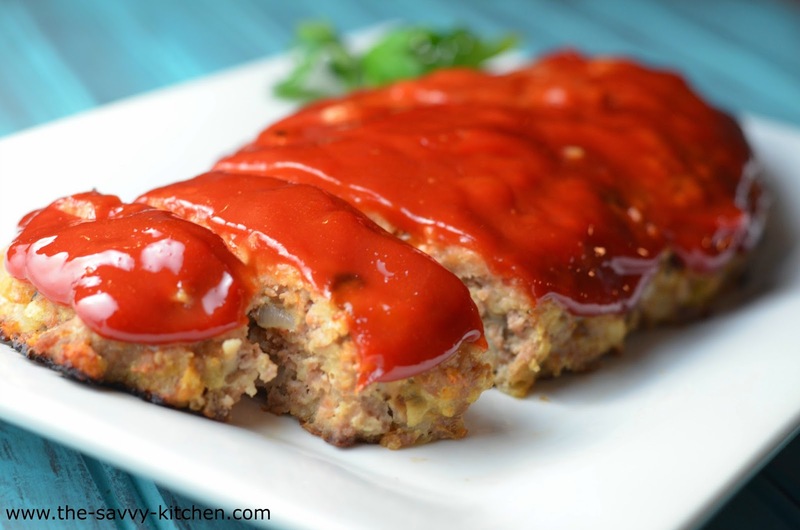 This is one of those recipes that I made on a whim, and it turned out absolutely incredible. Chris told me he wanted to try spaghetti squash for dinner, so I had to deliver. While the spaghetti squash was roasting, I threw some tomatoes in the oven alongside it as a base for the sauce. Best. Decision. Ever. I then threw the roasted tomatoes together with a few minimal ingredients, and they were actually things I already had in the house. The ingredient list doesn't make it sound like much, but it's really, really good. I used an immersion blender to smooth out the texture, and then tossed in some Parmesan cheese to make it extra creamy and delicious. I've actually already made it again since I first took these pictures. It's just that good. Enjoy! Preheat oven to 450 degrees F. Line two baking sheets with aluminum foil and spray with cooking spray. Cut each tomato in half. Place cut side up on one of the baking sheets. Cut the squash in half. Remove all the seeds and pulp and place cut side down on the other baking sheet. Place tomatoes and squash in the oven. 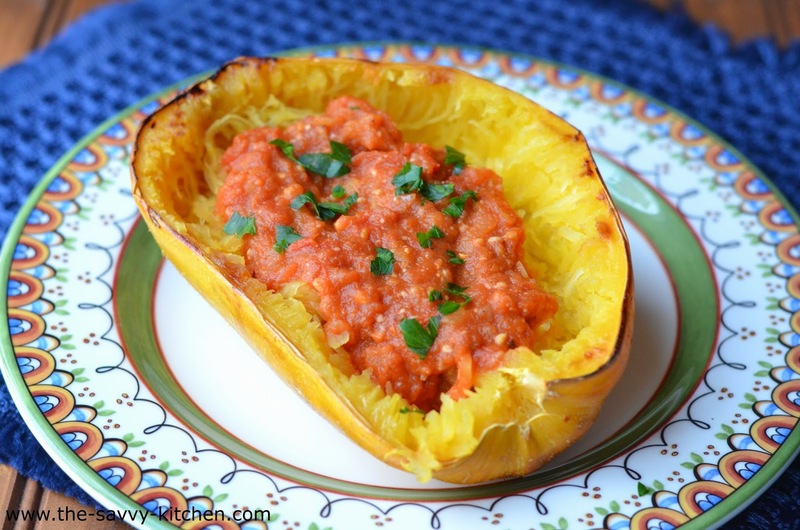 Cook tomatoes for 40 minutes and squash for 50 minutes. Once tomatoes are done, allow to cool slightly. 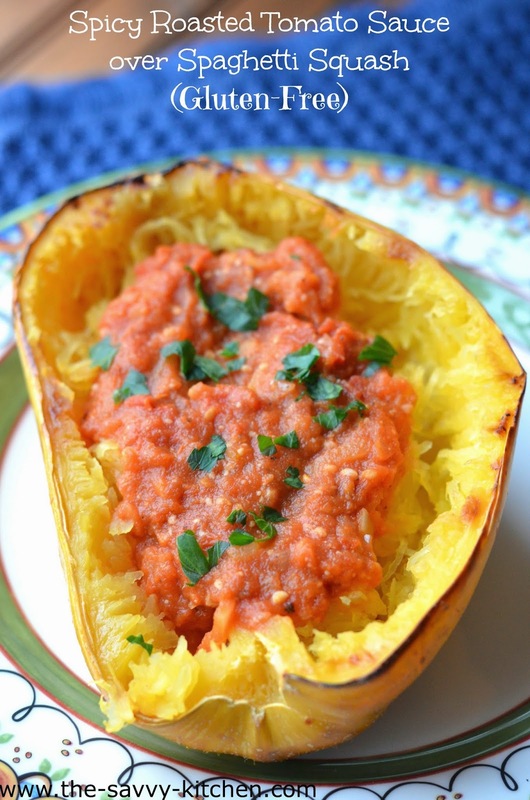 Once squash is done, flip each half over and use a fork to scoop up the stringy pulp. Meanwhile, heat oil in a medium saucepan. Add onion and garlic and cook for 5 minutes or until onions are translucent. Squeeze each tomato half into the pan so some of the juices are released. Add the tomato skins to the pan as well. Add sauce, red pepper, salt and pepper to the pan and stir to combine. Use an immersion blender (or regular blender) to blend the ingredients until they are smooth. Add Parmesan cheese and cook for an additional 5 minutes. 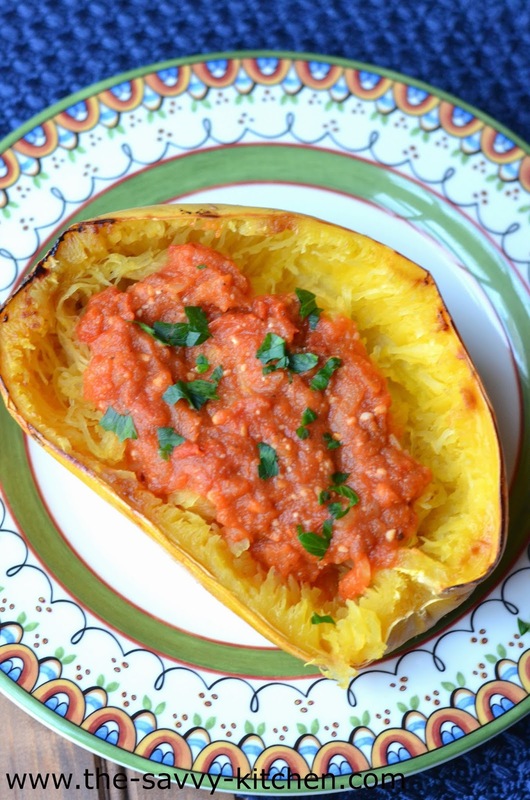 To serve, keep pulp in each of the spaghetti squash skins and top with a generous amount of tomato sauce. Sprinkle with extra Parmesan cheese, if desired.